While Native American culture has been embraced and celebrated within mainstream American cinema with great frequency and effect, Australia’s portrayal of its indigenous culture has, more often than not, found itself confined to the peripheral. But as indigenous characters have weaved their way through Australian cinema, one name has remained constant. From the spear-wielding teenager in Nicholas Roeg’s Walkabout to the larrikin, Rolex-wearing bushman in Paul Hogan’s Crocodile Dundee, David Gulpilil has been a motion picture cornerstone of his culture for nearly 40 years. 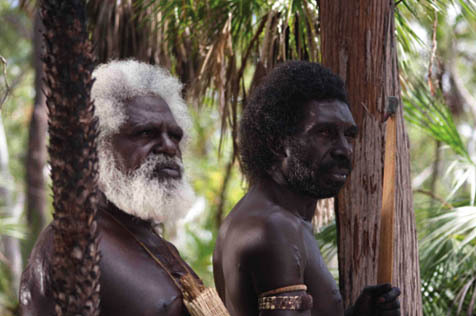 In 2002, Gulpilil appeared in two groundbreaking Australian period films, playing a native tracker in each. Rabbit-Proof Fence saw Gulpilil come under the acclaimed direction of Phillip Noyce, and The Tracker had the actor teaming up with cult director Rolf de Heer. While Noyce’s film gave Gulpilil the exposure and acclaim he’d previously experienced with Hogan, it was in de Heer that he found the support for one of his most significant contributions to Australian cinema: the award-winning film Ten Canoes. The film, which comes to UCSB’s Campbell Hall next week, is the result of a conversation between Gulpilil and de Heer about a black-and-white photograph by Australian anthropologist Donald Thomson. From the 1930s, the picture depicts 10 Yolngu men poling their way in bark canoes through the Arafura Swamps of far northern Australia. Being Yolngu himself, and hailing from the Mandhalpuyngu language group, Gulpilil was keen for de Heer to make a film in his home territory. “I showed a photograph from Donald Doctor Thomson to Rolf de Heer and said, ‘What do you think?’ Rolf de Heer started to write that story with Ramingining people, my people, and we started to work together,” said Gulpilil in 2006, when the film was released and eventually won a prize at Cannes. Aside from mosquitoes and other swamp-related problems, the filmmaking obstacles were plentiful. The original intent was to see Gulpilil both starring in the film and codirecting it. De Heer visited the actor’s home territory and-with the assistance of storytellers-a thousand-year-old story of misplaced love and revenge, played out amongst the ancient tradition of goose egg gathering, was soon born. But as production got underway, Gulpilil’s role within the film started to change. Officially attributed to “complex reasons,” cultural differences within the Yolngu community are considered to be the motivating factor for Gulpilil’s role change. Peter Djigirr took over as the indigenous codirector, making Gulpilil the film’s English-language narrator. With regional dialect an integral part of the film’s essence, it was a wise move: For 35 years, Gulpilil has been straddling traditional and modern Australian culture, and en Canoes is more than a worthy celebration of his dedication to both. Ten Canoes screens at UCSB’s Campbell Hall on Tuesday, November 20. Call 893-3535 or see artsandlectures.ucsb.edu.